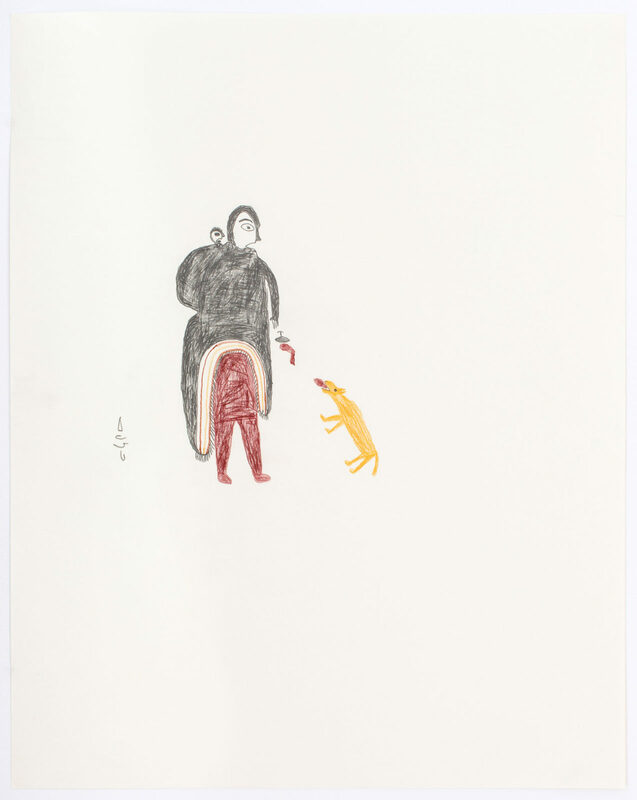 untitled (woman feeding dog), 1970, color pencil graphite, paper, 19 x 24 in. 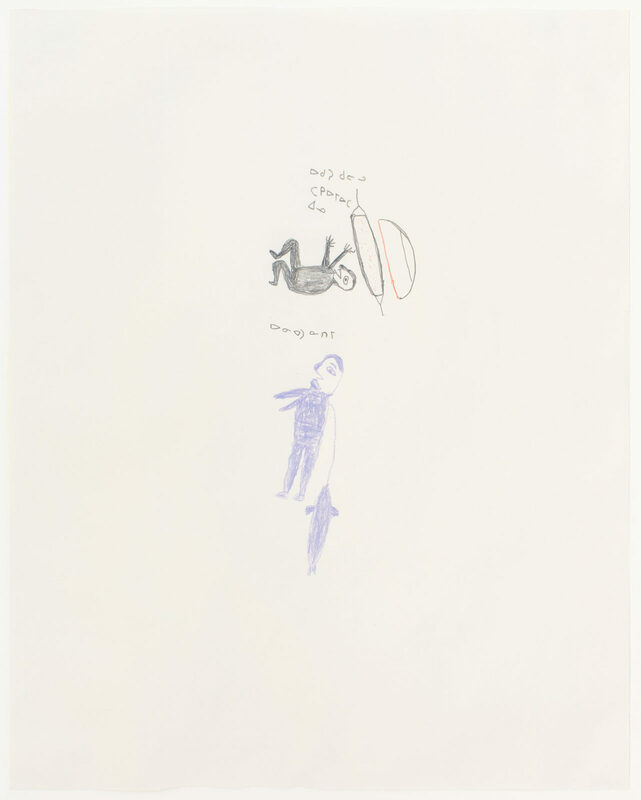 untitled (man and figures on sled), 1970, color pencil graphite, paper, 19 x 24 in. 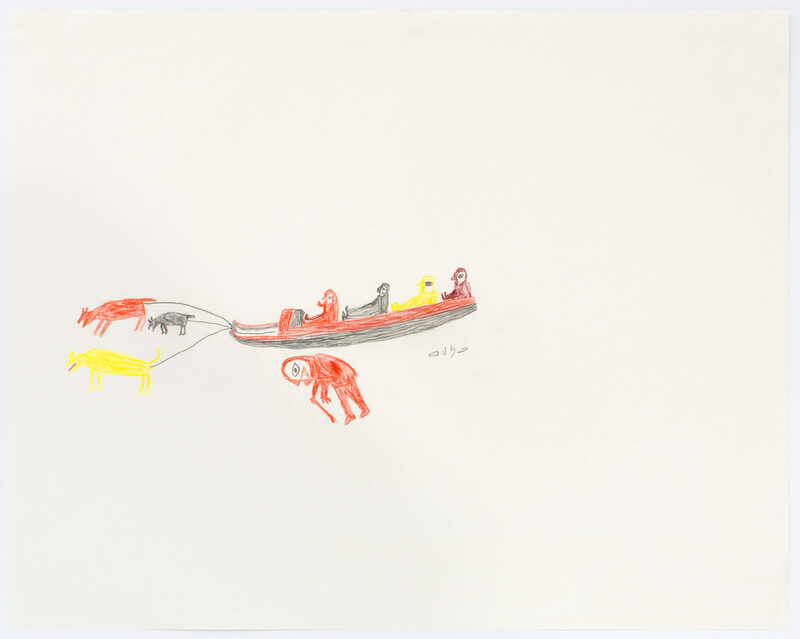 untitled (man and dogs attacking caribou), 1970, color pencil graphite, paper, 19 x 24 in. 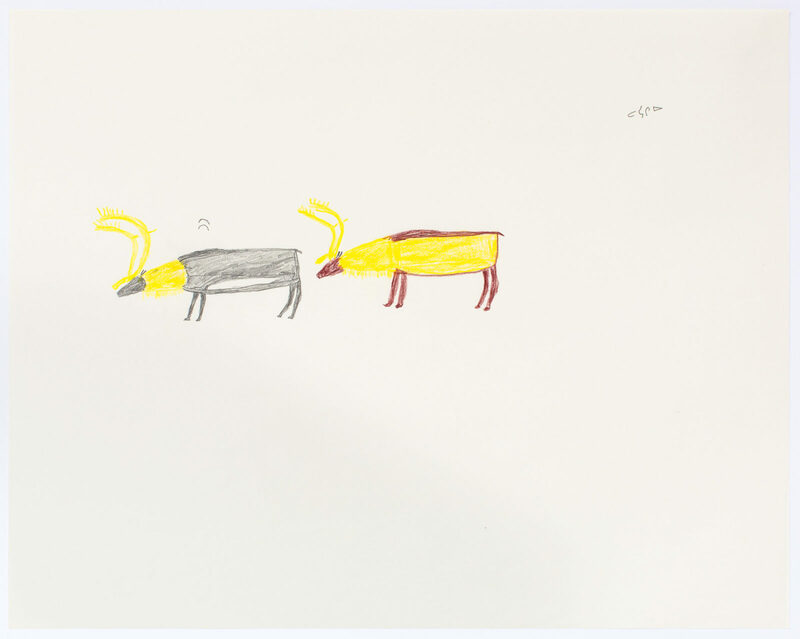 untitled (two caribou), 1970, color pencil graphite, paper, 19 x 24 in. 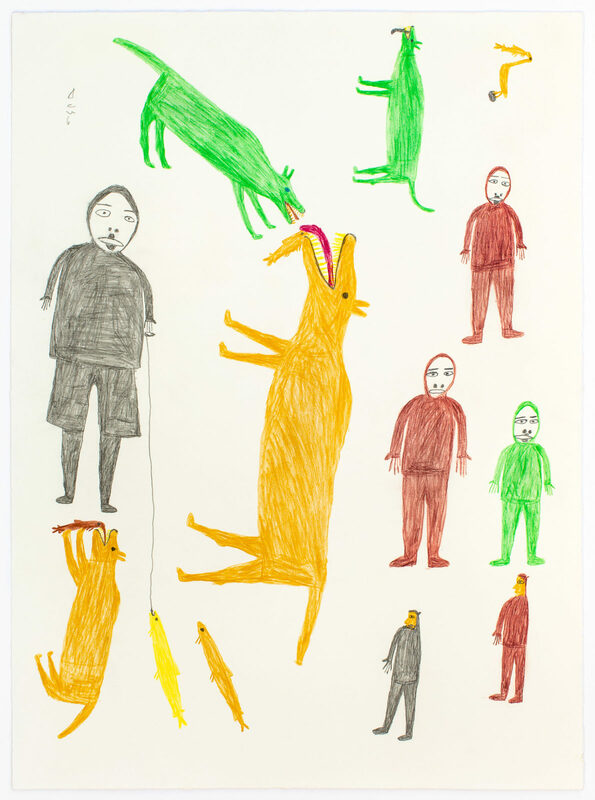 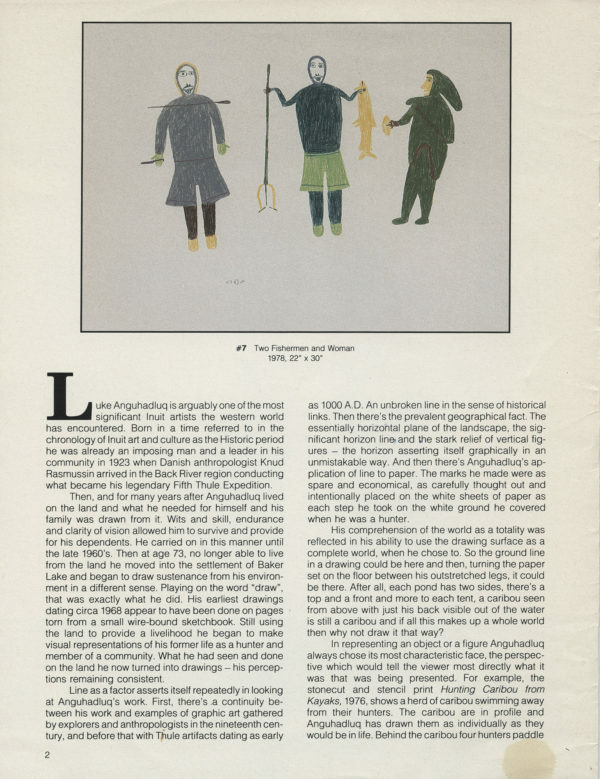 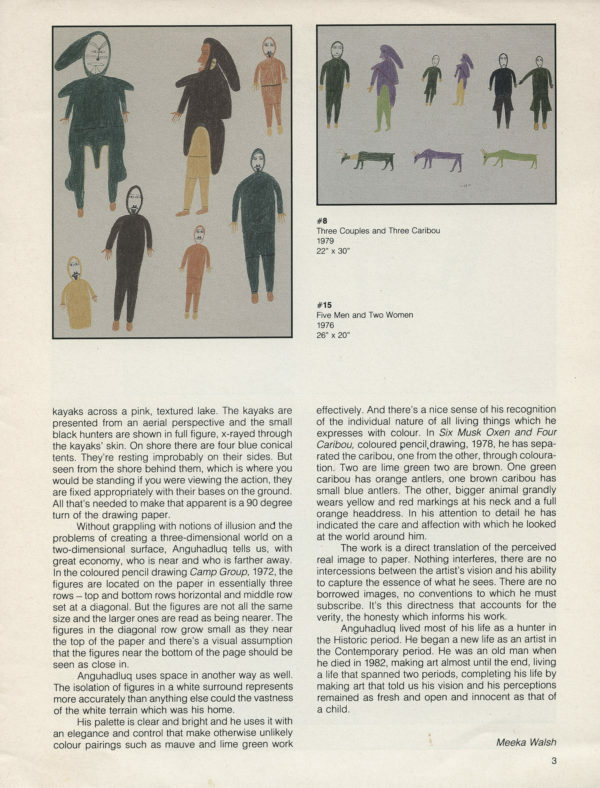 untitled (man and tethered dogs), 1970, color pencil graphite, paper, 19 x 24 in. 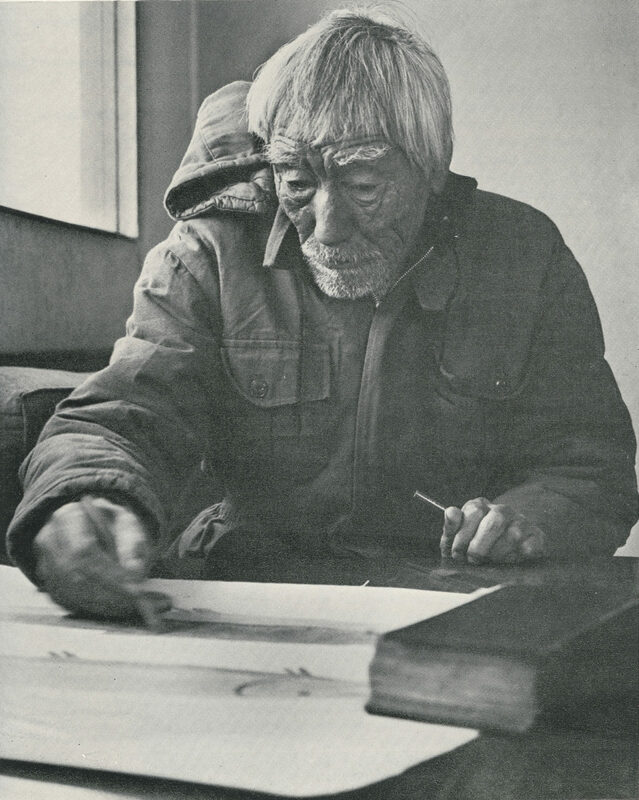 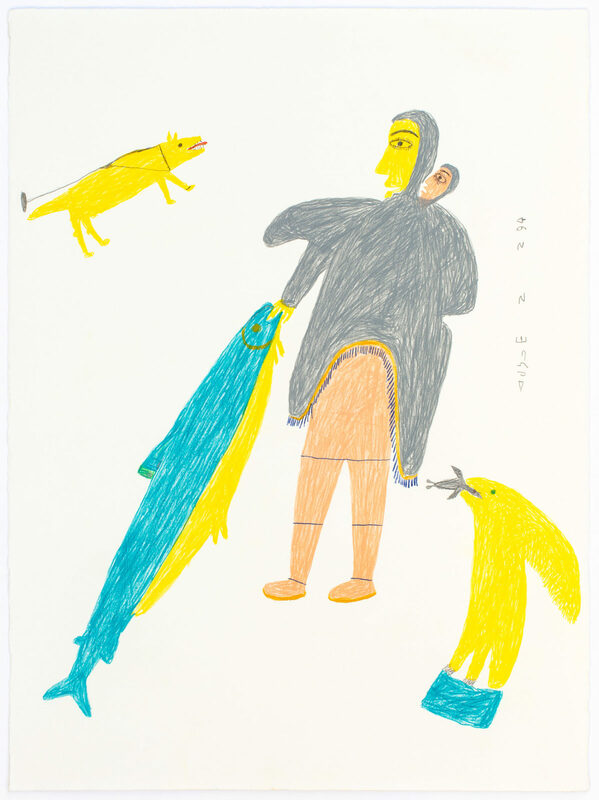 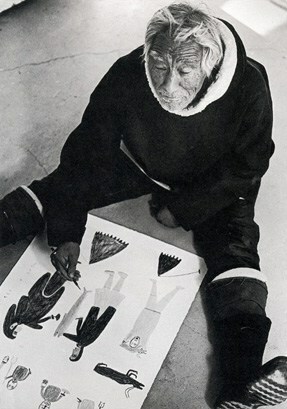 untitled (hunter with seal and kudlik), 1970, color pencil graphite, paper, 19 x 24 in. 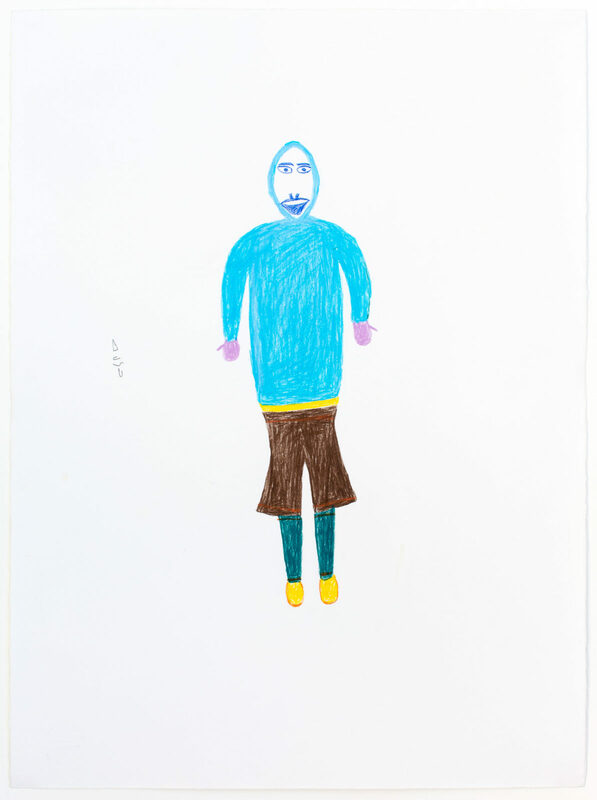 untitled (man and fish), 1970, color pencil graphite, paper, 19 x 24 in. 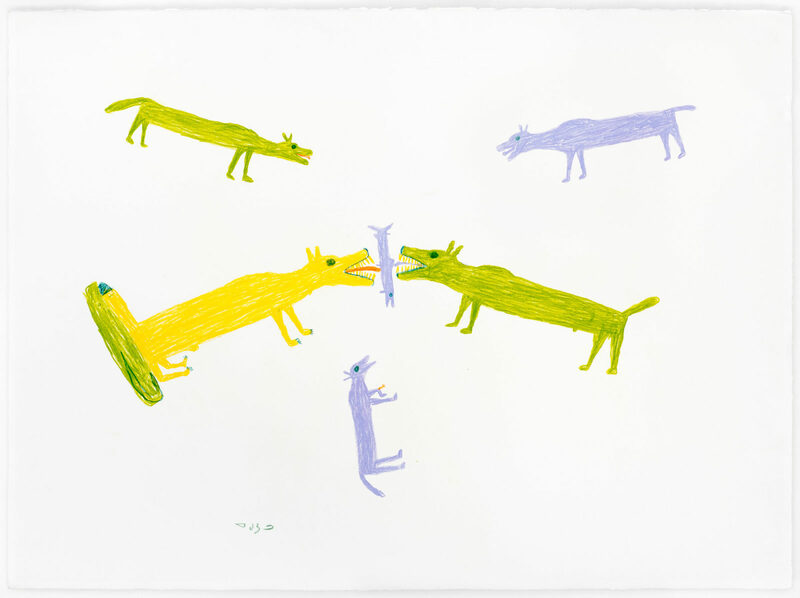 Dogs Eating Fish, 1977, graphite, color pencil, paper, 22 x 30 in. 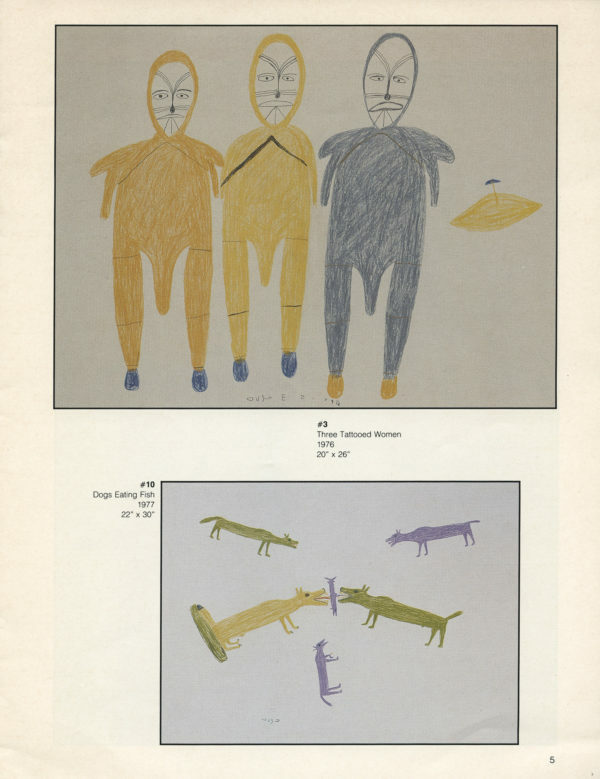 untitled (figures and dogs), c. 1975, graphite, color pencil, 22 x 30 in. 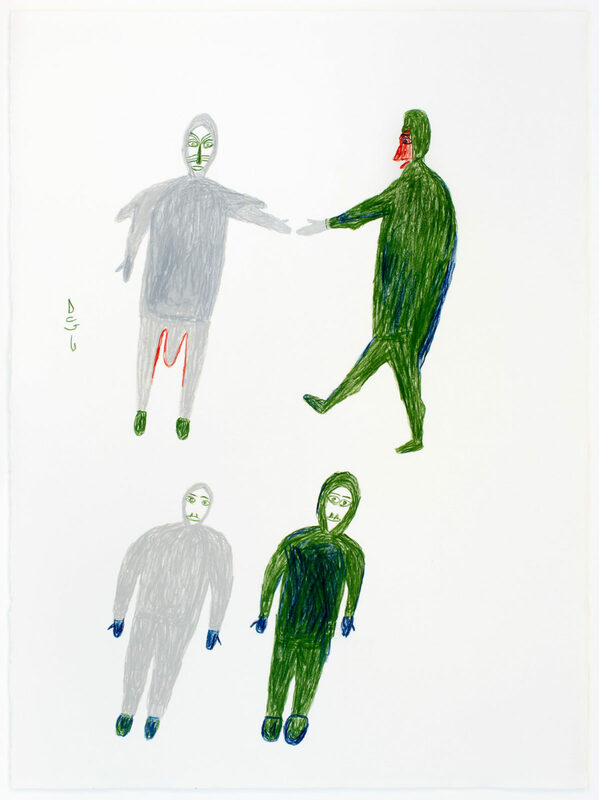 untitled (four standing figures), c. 1980, graphite, color pencil, 22 x 30 in. 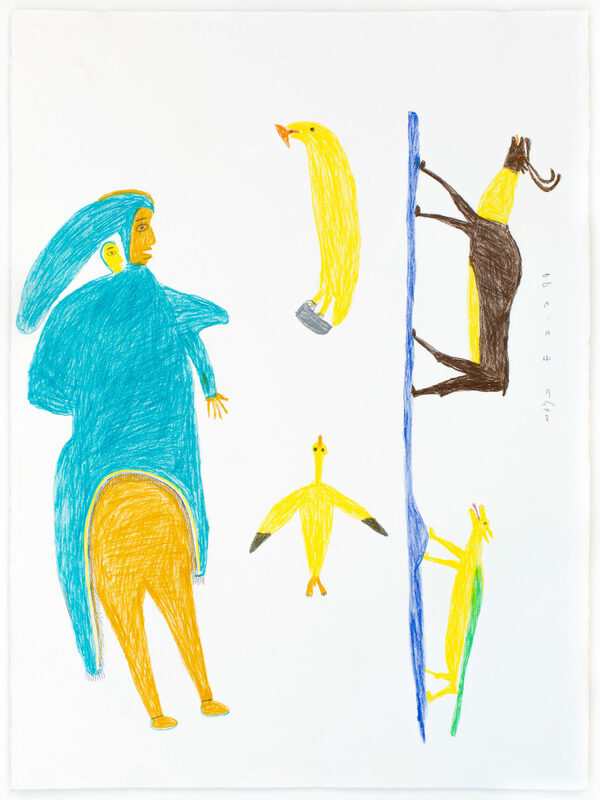 untitled (woman with animals), graphite, color pencil, paper, 22 x 30 in. 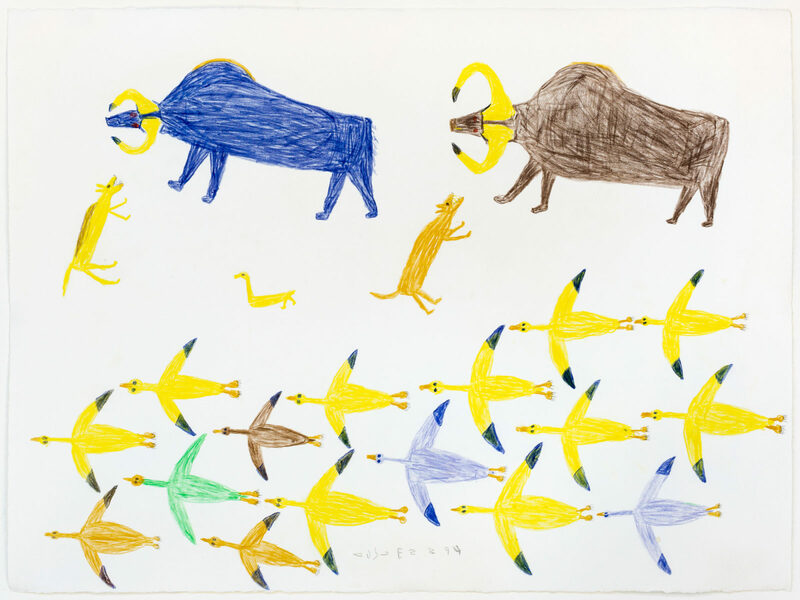 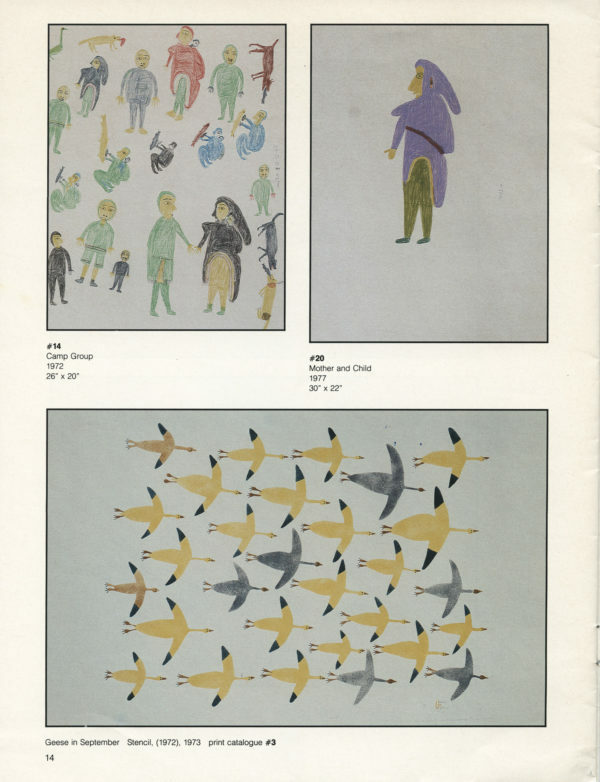 untitled (birds and Muskoxen), 1973, graphite, color pencil, paper, 22 x 30 in. 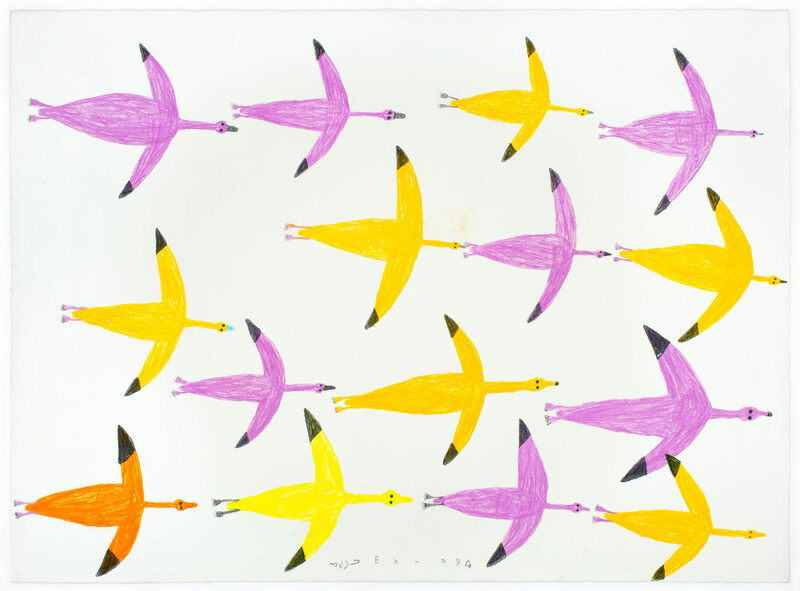 untitled (birds in flight), c. 1970's, graphite, color pencil, paper, 22 x 30 in. 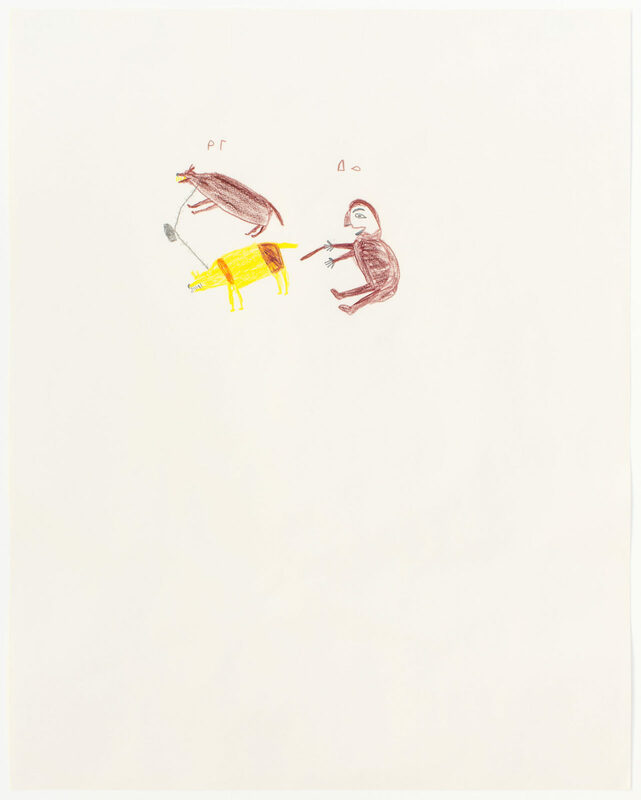 untitled (butchering animals), 1973, graphite, color pencil, paper, 20 x 26 in. 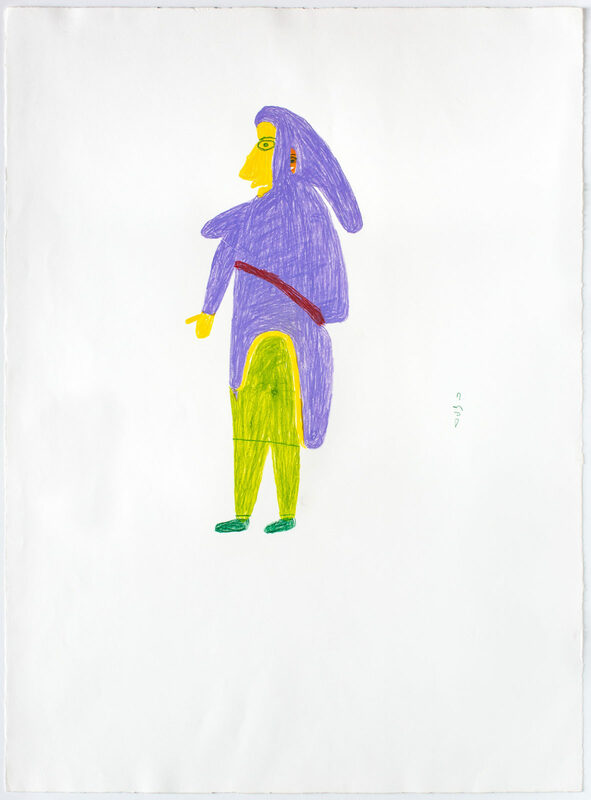 untitled (woman with big fish), graphite, color pencil, paper, 22 x 30 in. 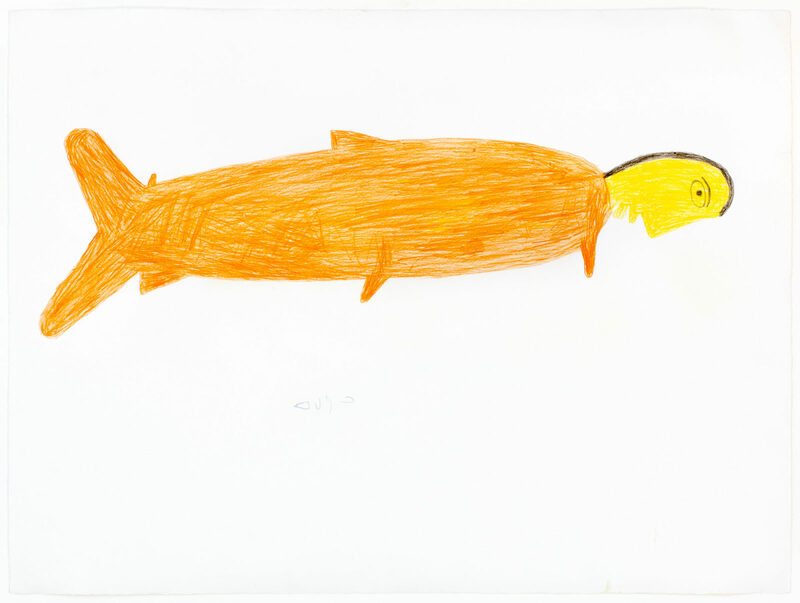 untitled (fish spirit), c. 1977-78, graphite, color pencil, paper, 22 x 30 in. 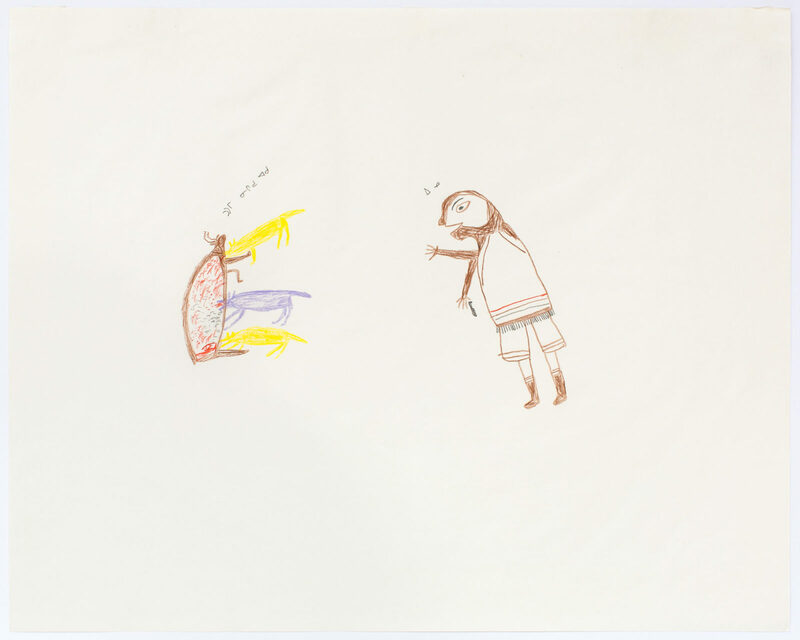 untitled (inuk with brown pants), c. 1977-78, graphite, color pencil, paper, 22 x 30 in. 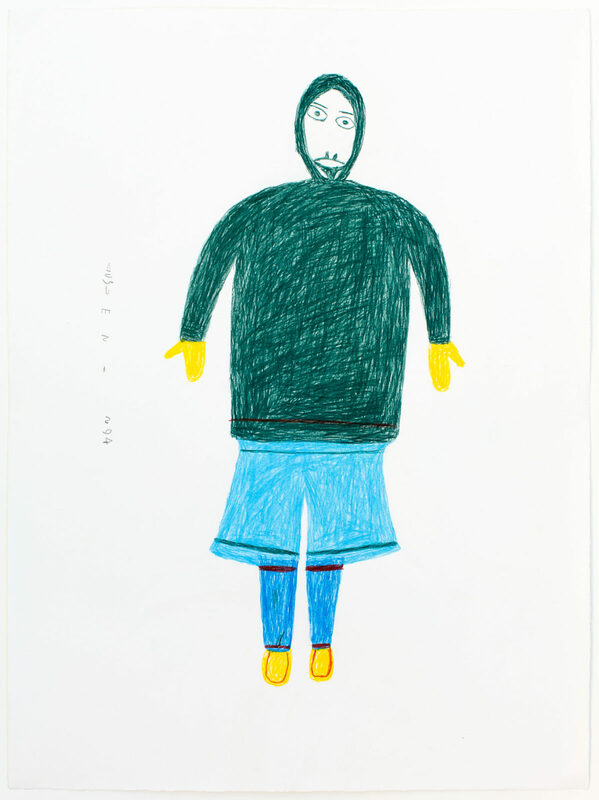 untitled (inuk with blue pants), c. 1977-78, graphite, color pencil, paper, 22 x 30 in. 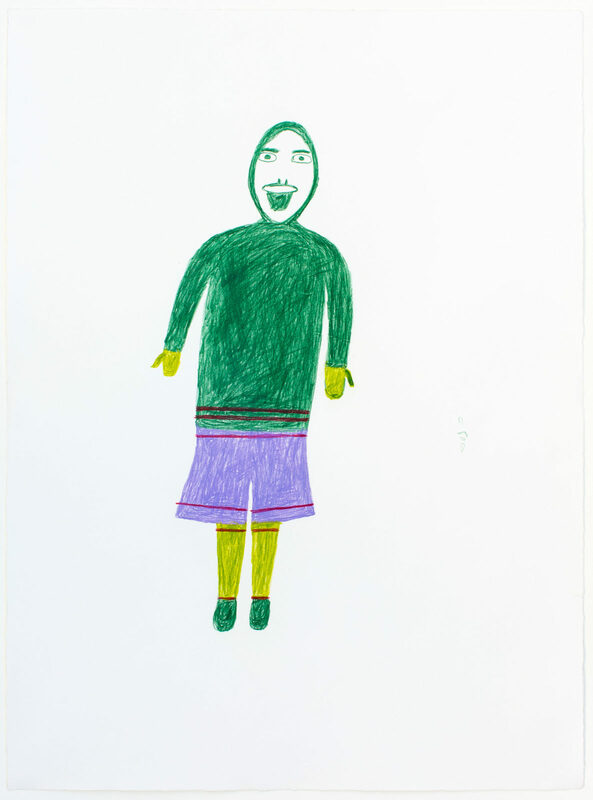 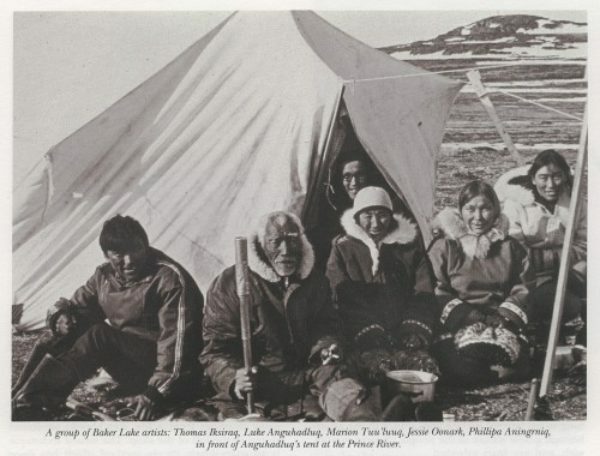 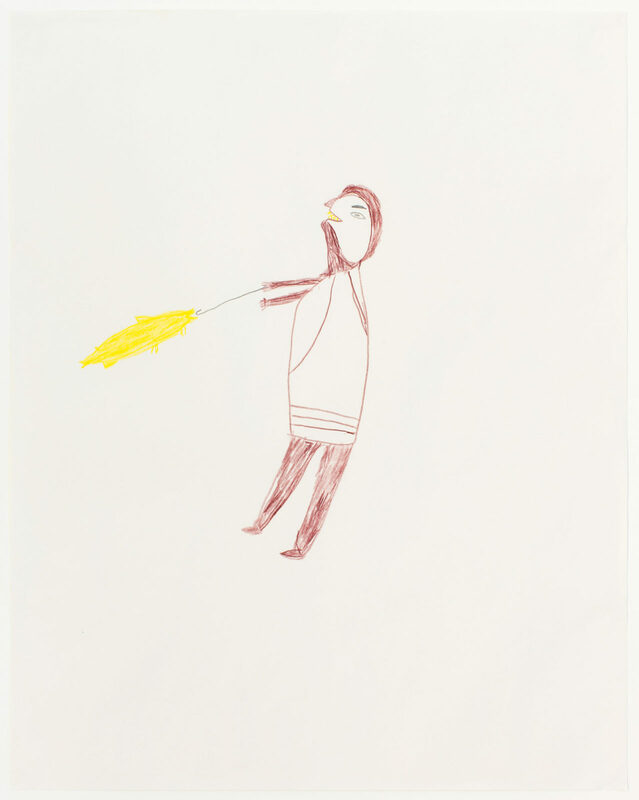 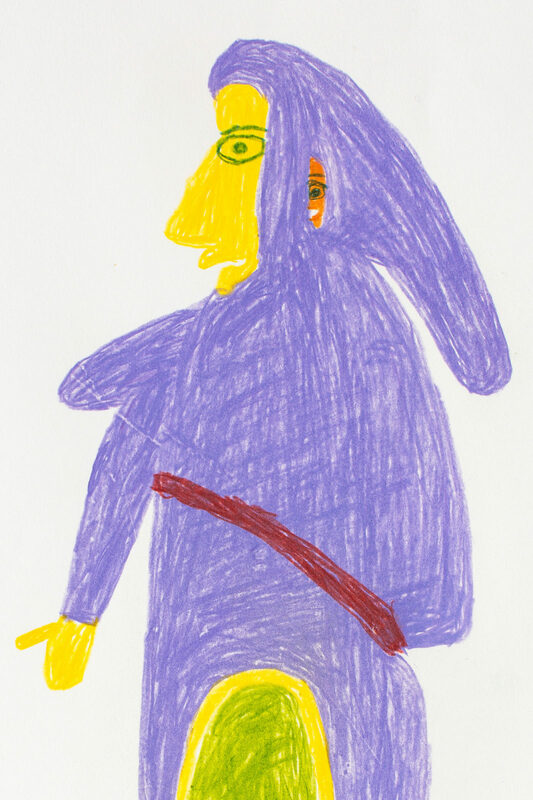 untitled (inuk with purple pants), c. 1977-78, graphite, color pencil, paper, 22 x 30 in. 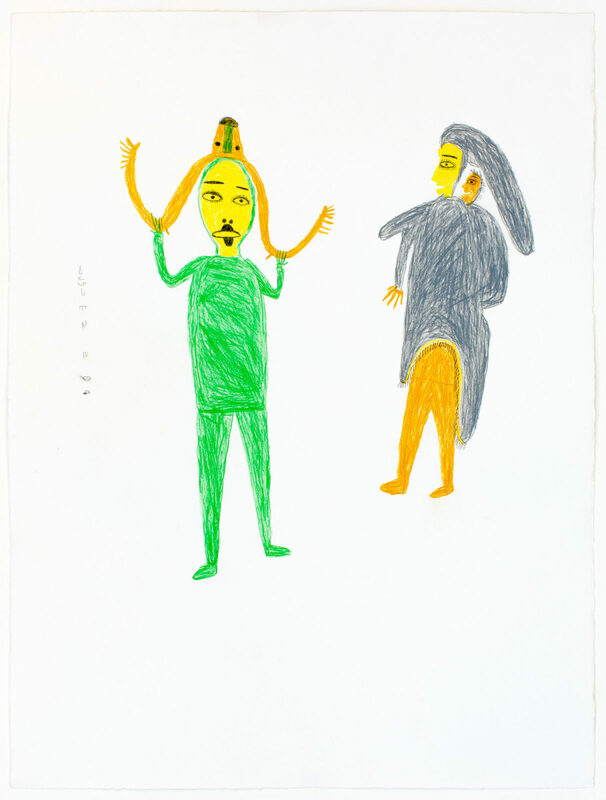 untitled (mother and child), 1977, color pencil, paper, 22 x 30 in. 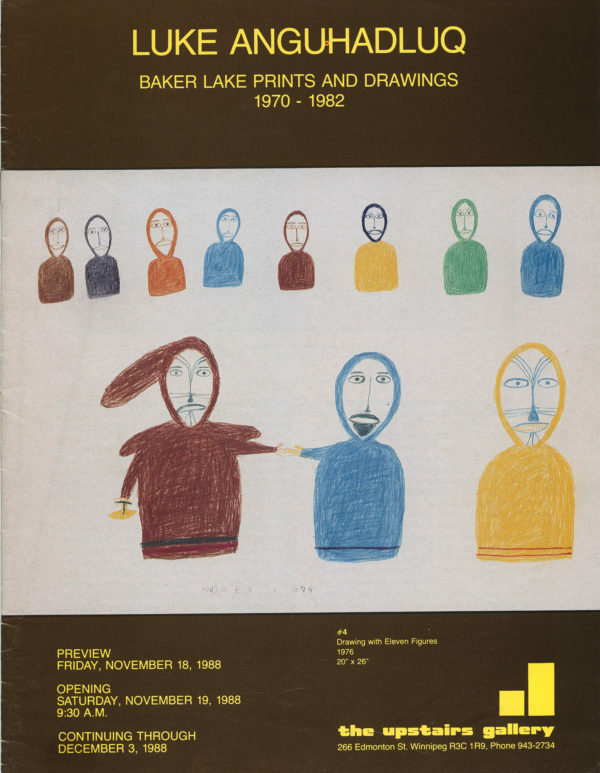 Man And The Land, 1972, stone cut, stencil, 45/50, 17 x 21 in. 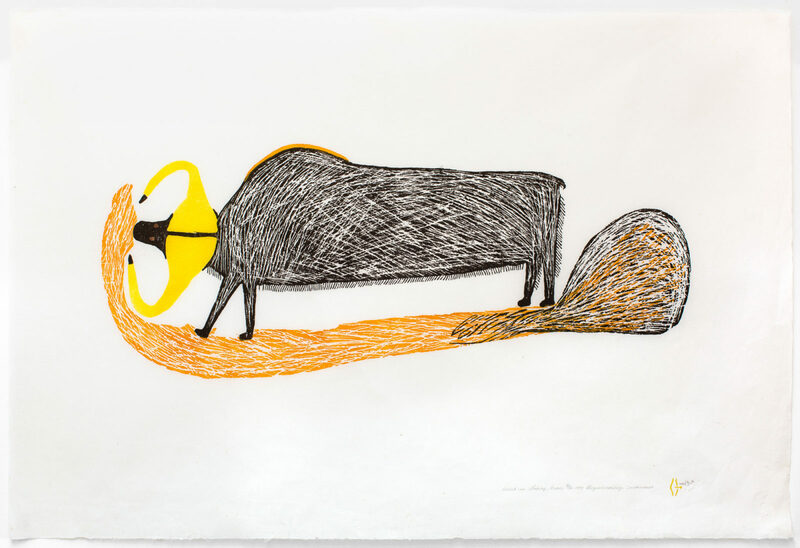 Muskoxen, 1973, stonecut, stencil, paper, 34/50, 26 x 36.75 in. 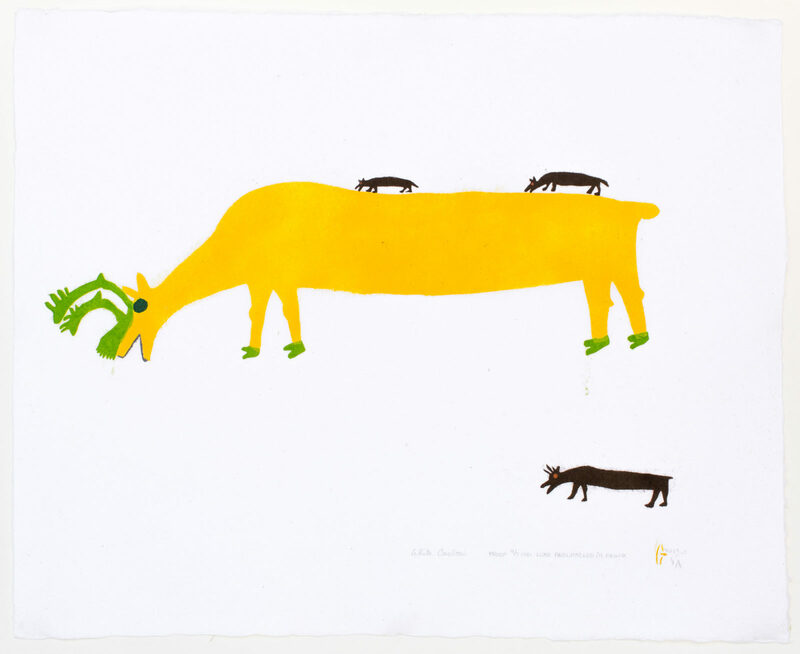 Musk Ox Eating Grass, 1973, stonecut, stencil, paper, 43/50, 25.25 x 36.75 in. 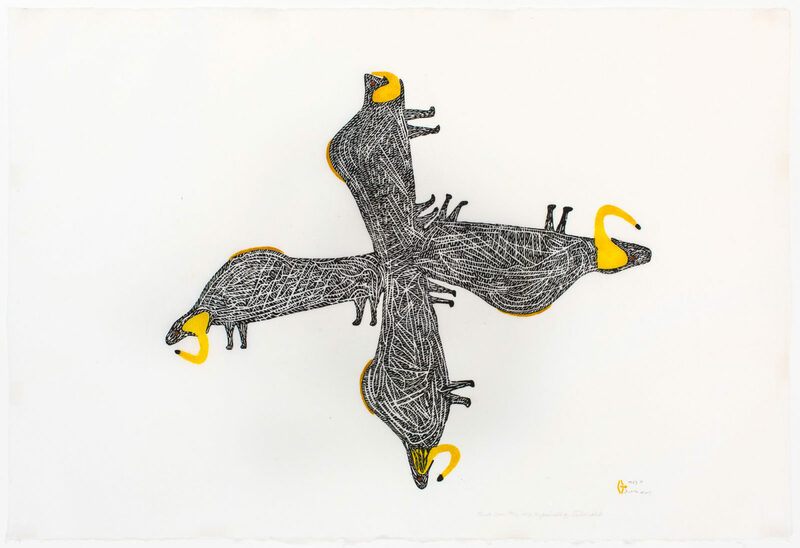 String Game, 1973, stone cut, stencil, paper, 44/50, 12 x 19 in. 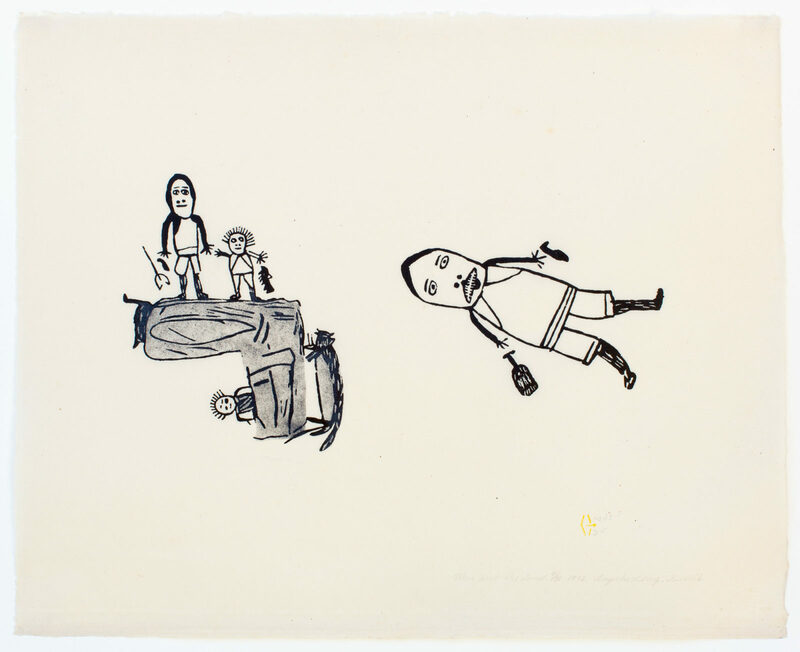 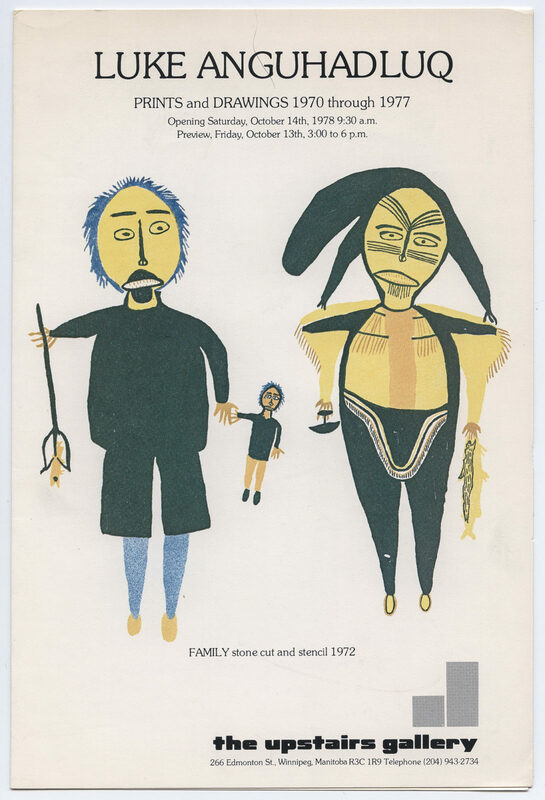 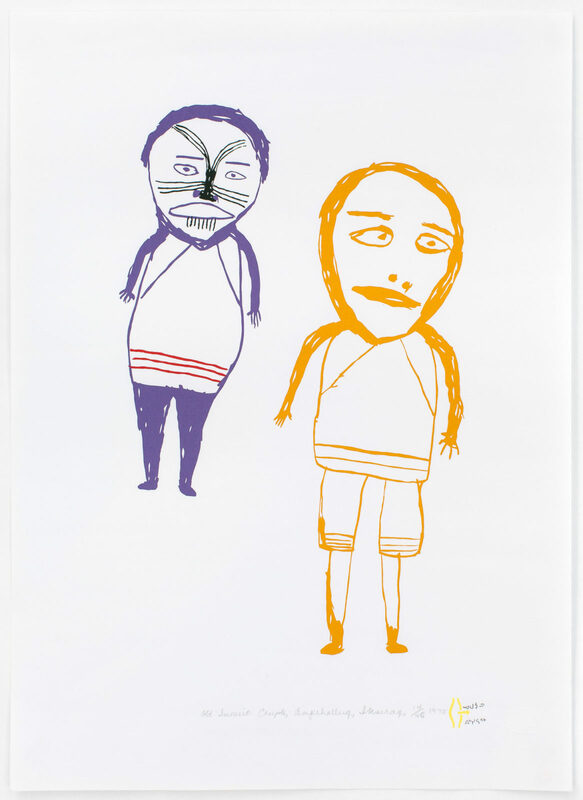 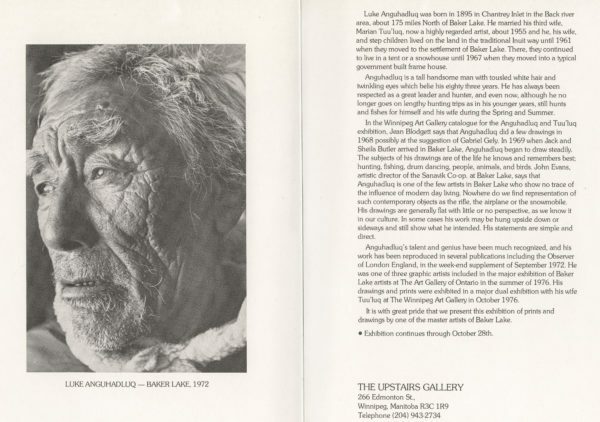 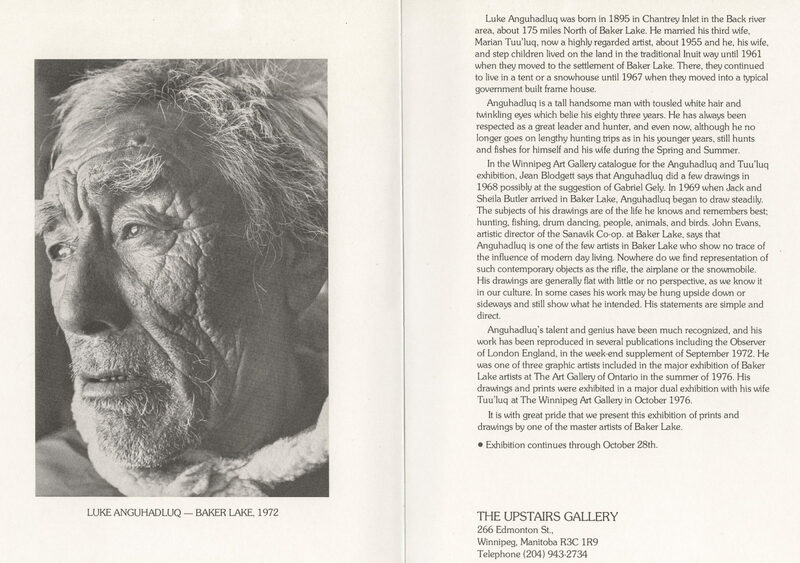 Old Inuit Couple, 1975, silkscreen, paper, 14/45, 15.5 x 24.5 in. 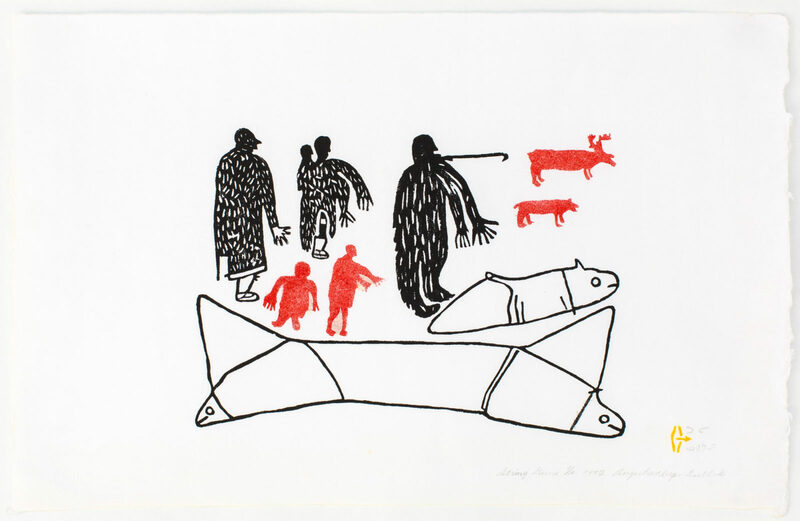 White Caribou, 1981, stonecut, stencil, paper, AP 4/7, 21 x 26 in. 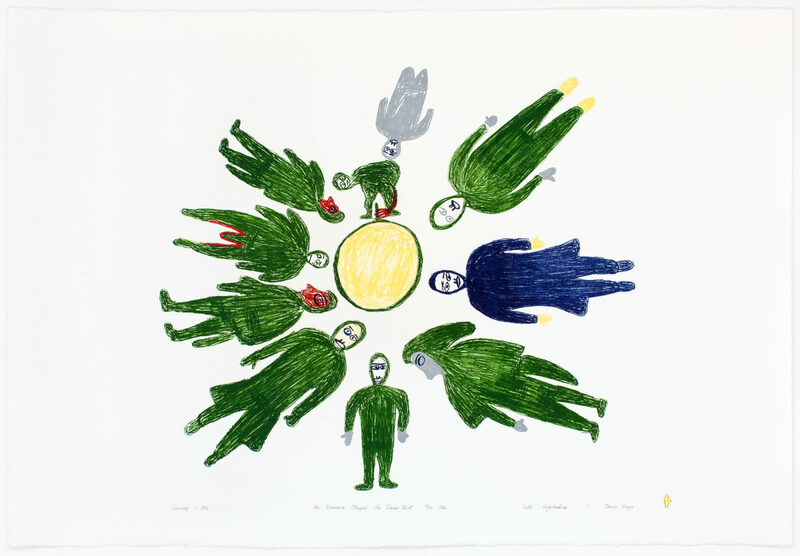 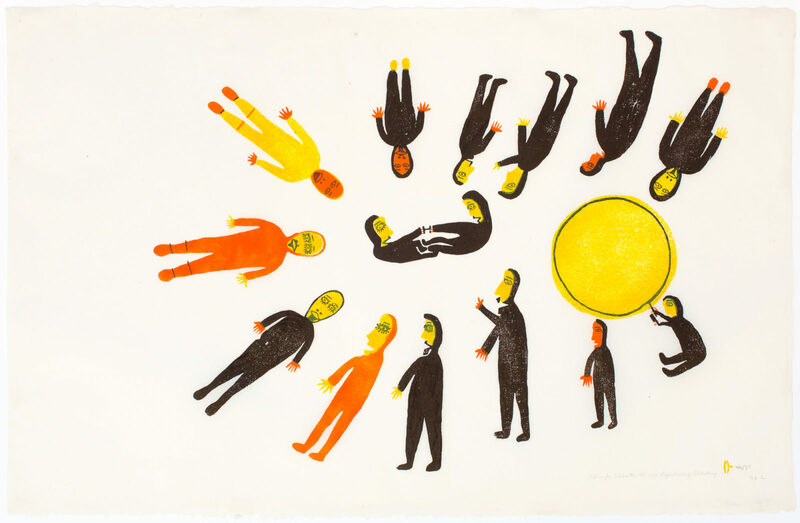 A Time For Celebration, 1974, stone cut, stencil, 15/50, 25 x 38.75 in. 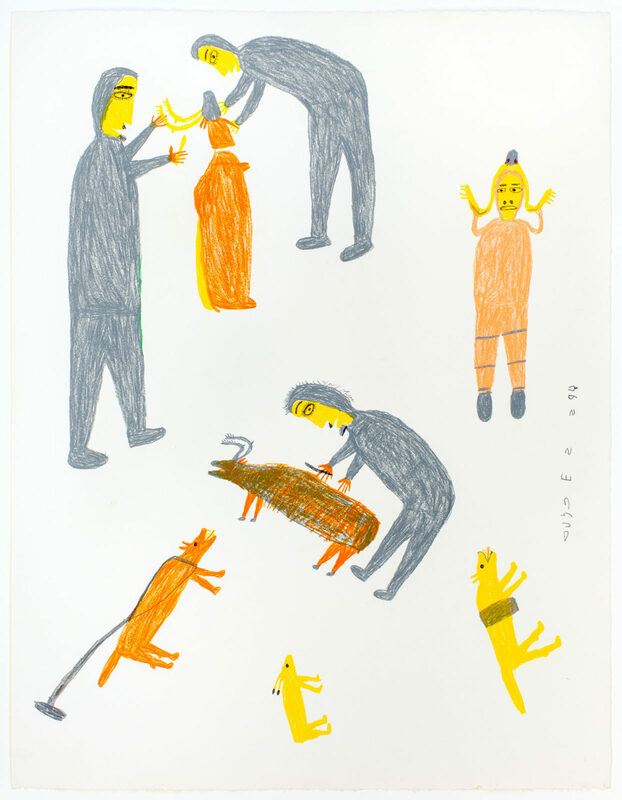 The Drummer Stopped The Drum Beat, Feb. 1982, lithograph, paper, 10/30, 27.5 x 40 in.